Consumer interest in gut health continues to grow and is one of the top health trends for 2016. Did you know we have 10 times more bacterial cells inside of us than we do human cells, and most of those are in the gut? I call it the gut ecosystem. Eating a variety of nutritious foods with fibre is my top recommendation to promote digestive health. Whole grains, pulses, fruits and vegetables are great sources of fibre. Women should aim for 25 grams of fibre per day and men should aim for 38 grams per day. Start slowly, adding more fibre every few days, and drink plenty of water. This will help prevent the gas, cramping and bloating that can occur if you add fibre too quickly. Prebiotic foods contain non-digestible ingredients and when consumed provide a beneficial environment in the gut for good bacteria, including probiotics, to thrive. The most common prebiotics in our diets are forms of dietary fibres because they resist digestion in the small intestine and reach the large intestine (colon) where the majority of the gut ecosystem -- known as the microbiota -- exists. When dietary fibres, as well as resistant starch and polyphenols (micronutrients) in the diet resist digestion in the small intestine and reach the colon, they become available for use by the microbiota to promote good bacteria and suppress the growth of bad bacteria. This combination of factors including prebiotics in our dietary pattern has a cumulative effect on the microbiota in the colon. I was first introduced to sorghum during my undergrad at the University of Guelph when we were studying celiac disease; then it popped back into my pantry three years ago. 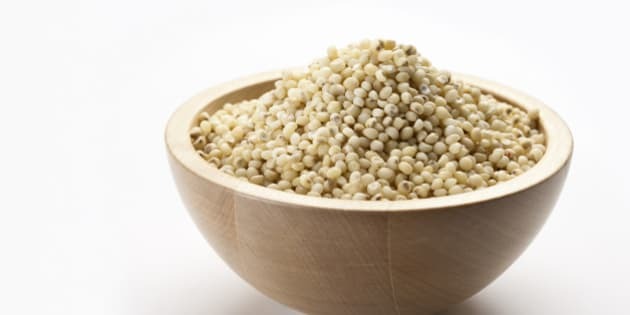 Sorghum is a gluten-free whole grain that has shown prebiotic potential. Dr. Nancy Turner, associate professor and director of TAMU Space Life Sciences Training Program at Texas A&M University, explains, "Our research team has shown that sorghum brans containing polyphenols are capable of modifying the microbiota in a manner that supports intestinal health. Some of the changes in the host include reduction in markers of inflammatory processes." For my clients, I always highlight the important relationship of gut health to immune health and brain health. Inflammation is a leading risk factor for chronic diseases such as cardiovascular disease and diabetes. Fortunately, consumers have become more aware that healthy habits, including helpful food choices, can decrease inflammation in their bodies, thereby lowering the risk of these chronic diseases. Dr. Turner also identifies interesting emerging research, noting "In addition to the data published by my graduate student Lauren Ritchie, we have other studies yet to be published that demonstrate protection against colon cancer in an animal model of the disease, as well as improvements in metabolism and microbiota in overweight subjects. Because of the consistency in the responses between these different studies evaluating several disease processes, it appears that consumption of sorghum brans containing high levels of polyphenols is beneficial in the maintenance of intestinal health." The beneficial effect of certain sorghum brans on intestinal microbiota is derived from the mixture of fibre and polyphenols they contain. The burgundy-coloured plants are one of the most common sorghum varieties for human consumption. At the Louisiana State Agricultural Center, research is being conducted to identify the best processes to achieve the highest prebiotic components as the sorghum bran is further processed into fractions and flours. Get your digestive track off to a great start in the morning by combining ¾ cup of cooked whole grain sorghum with ½ cup of berries, 2 teaspoons of pumpkin seeds, 1 teaspoon of slivered almonds and 2 tablespoons of 2% Greek yogurt for a delicious prebiotic and probiotic breakfast. Load up on the prebiotics in this vegetarian salad. In a bowl, add one can each of rinsed and drained black beans and kidney beans to 2 cups of cooked sorghum. Mix with ¾ cup of diced orange peppers and two sliced green onions. In a separate bowl, combine ½ cup of olive oil, ½ cup of balsamic vinegar, 1 tablespoon of lime juice, then salt and pepper to taste. Whisk thoroughly. Pour dressing on sorghum mixture, toss and serve. You can also pop sorghum in the same way as corn. However, the sorghum kernels are much smaller and lighter than corn. These delicious bits of crunchy fluff can be served at your next movie night or as a garnish for almost anything, including soups and entrées. It's important to make positive lifestyle decisions including healthy food choices to promote digestive health. Research suggests that prebiotic-rich, gluten-free sorghum grains are an excellent option as part of your overall healthy dietary pattern!